2.) Skills mention “up to max of your level + 5 into any particular skill”, does this mean 1st can put 6 ranks into a skill? !, or is it rank = level, and you get +5 to that skill? 3.) What are the rules on Piecemeal Armor? 6.) How are magical Item bonuses going to work? Do Stat items follow a 5lv formula of +1 stat (so 25th lv item =+5 to X stat). A)What class, race, and specialization were the PCs? “Roth the hammerer” Human Sharu (Storm-striker), with Shockbolt missing, used Wizard Bolt w/Elec damage till official one is released. Thanks to a wording from Light Hammers and Spellweapon class feature, able to throw lightning hammers with spellweapon (Fun combo likely most Sharus’ encouraged to use, but not overly so in any capacity). “Gurdirir Bjorn” Human Warrior (Brute) with Power-attack, Sneak-Attack, Inc-Sneak, Defending shield, &Staggering-crit, standard Sword & Board. “Kingston Caine” Dwarf Warrior (Guardian) with Defending Shield, Diehard, Stand-still, and Healing. Wielded Warhammer & Tower-Shield, with 2H flail. B)What levels did you play at? Started at 1st level and recently just reached 5th level. We did roughly 2-3 encounters per level on generally generic terrain, and set Party formation. C)How long was a typical game session? About 3.5 hours per session, with combat rounds taking about 20-60 min to complete, and took 3-4 ingame rounds. D) Did the automatic and at-will abilities of the heroic feats give the PCs enough to do? The Sharu player felt this was the case, while the other two moreso had passive abilities, so they hit a sense of “routine” after awhile. E) What sort of creatures did the PCs fight? Encounters corresponding to lvs they were done at: EL1a= 3xDire rats, EL1b=6xDire Rats, EL1c=Single Zombie (CR 2). EL1d=Social fiat encounter with 10xdire rats where shooed em off via intimidate. EL2a=3xSkeletons, EL2b=3xGoblins, 2xOrcs. EL3a=3xWolf, 2xGoblins (riding), EL3b= 1xWolf, 3xOrc, 1xLizardfolk, EL3c=2xGhouls, 3xGiant-Centipede. EL4A=Bugear (CR 5) & 6xOrcs, EL4b=4xSkeleton, 3xZombies, 1xghoul. F) Did they have an easy or hard time with these battles? Most of these battles were easy enough for the PC’s, at full HP per each battle thanks to “Kingston Caine” Dwarf Warrior (which was GRAVELY needed in order to survive these low levels). The Full HP state had no effect on the difficulty of the battles, that is, battles weren’t easier or harder because of it, and PC’s dropping or otherwise was very much still possible (obviously if didn’t have it, likely been more casualties or trips back to town). EL1c almost nearly one-shot the Sharu when enemy went first, but was then promptly killed by “Bjorn” Human-Warrior’s mix of SA & Pow-attack in one hit. EL2a we discovered skeletons better off using their fists than using mix of weapon & first (slight 1-2pts damage isn’t worth the loss of accuracy for them). EL2b was a bottleneck encounter, Orcs were finished before their deadliness set in, and learned without Aoo’s Goblins can easily shoot you adjacently, and then fly off decent speed (if not onto cliff terrain or such to make them tenacious to take on). EL3c We learned that Ghouls one of the most powerful monsters so far, when an unlucky roll put the Warrior into Paralyze or “helpless” and coup-de-Grace by surviving centipede into Comatose( see ‘K’). EL4b The Ghoul was kiled before it could do much, but showed in the system how dangerous focus fire can be from Skeletons, when it nearly took out the Human Warrior (they attack twice each, doubling their chances of hit, especially with how flanking works, and lack of DR/soak mechanic). G) Did the players use boosts a lot, or did they try to save them as long as possible? They mostly tried to save them as much as possible, especially when they were low at EL3b. Group stated about 50/50 where conserved till things got heavy (when rerolls were needed most). H) Did everyone have enough interesting abilities to spend their boosts on? Not really, at best it was maybe 3/4 of abilities were worthwhile for one PC. I) Were the class auras helpful? Given the characters were all Weapon users, the Weapon reroll Aura was the only Boost Aura that saw use. That said, looks like it saw more use as an option than any of the other powers that were done for the most part. I’d say it was roughly Half Aura rerolls and the other half being boosts from their powers (if at all). J) Did the players and GM have fun? For the most part, though its been mostly a linear set of encounters, there has been light exposition and roleplaying between and even during some encounters. As well as some team synergy of powers made things feel a bit fun. Such as Sharu getting Rapid shot for his hammers, or the two Warriors taking Phalanx Formation to be nigh untouchable against the zombies in EL4b. became Unfun at EL3c when had to discuss [comatose] mechanics and its interaction with healing (see K below). That said, do agree the game still needs a greater level of polish if its to be to its full entertainment value, taking account of current abilities at non-low levels, well as to avoid Padded Sumo. K) Did you find anything that was confusing, contradictory, or otherwise could be explained better? Most aggregiously, it was in EL4b, The game slew to a grinding halt when we had to get RAW clarity on the [Comatose] condition, and how healing may affect it. Since written up a passage that clarifies the “Health status” condition terms better. While I myself am still working on a Feedback document in general addressing many designs for this game. For these sessions themselves, Cooler [Cronks] have been highly requested, DR/Soak mechanics for warriors to better take up hits from multi-hitters like Skeletons, Orcs, and Ghouls could go long way down the road. As well as Stand-still power itself, being less penalizing in its function (AP AND boost cost), as can see it breaking down later on when you start facing increasingly more opponents. For the “Tanking” Dwarf-warrior, example of better [Cronk] requested so that could play “Stop & Go” with minions and other mass opposition later on. From here on:Intending to try and go to 5th,10th,15th, 20th,25th benchmarks, likely doing the ones in-between as well. I myself, am not really satisfactory with using a pre-existing game system for things like Armor. As it clunks with physical skills, unfitting for a new fantasy game set on greater simplicity. 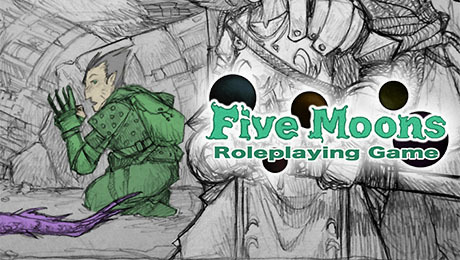 In the upcoming future, hoping to take the Prototype Five Moon characters to figure out a better armor system. As well that likely test and see if 5M intends to have +1 to two stats every 5lvs, similar for stat items as well (which I can assume only 4 slots, plus weapon and shield). Look on the bright side, you would’ve had to do a LOT of waiting, especially for the Playtest (6-7 months from the original planned dates, especially if you’re one who checks KS 2-3 times a day…yeah). The game also has a long ways to go to being a finished product I’d say, and not just because of the playtest itself having some “unfinished business”. I wouldn’t be surprised if an actual release date wouldn’t be till next Gen-Con, so that it gets better, more maximum coverage. The rules for how many boosts you get, how they are recovered, etc. should be right up near the beginning of the doc, not buried in the glossary. So I was looking at the Armor rules, and I noticed in the piecemeal “Advanced rule” that piecing together armor of the same set resulted in higher AC than its original counterpart. Was this Intentional? This is evident in Mail’s Chain (counts up to 13 vs 12), Scale (counts up to 13 vs 10), and Plate’s Splint (counts up 16 vs 14), Fullplate is completely fine & accurate. Finally, What should be the rules for acquisition of items during the Playtest? My assumption is each PC gets an item every 5 levels. However, this is likely too slow, and I’m unsure what expectations you have in mind for that. If items had attached “item rating” or “tier” then scale items to being in those rating or tiers at respective levels, could help make a scaling system for this case. Also while should be a Feat to make Magical items, I would also suggest divorcing normal Coinage from making higher level items, So that money doesn’t always equate to power (unless that’s the intent? ), & can have fantasy locales like gem castles, golden pyramids, without PC’s wanting to strip the entire thing down (and rightfully so! ).